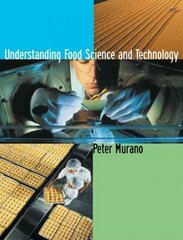 Understanding Food Science and Technology (with InfoTrac) 1 Edition UNDERSTANDING FOOD SCIENCE AND TECHNOLOGY is a comprehensive introductory level text that provides thorough up-to-date coverage of a broad range of topics in food science and technology. The text begins with an explanation of the interdisciplinary nature of food science (including biology, engineering, chemistry, and physics) and describes avenues of advanced study in the field. The text explores key food commodities and food composition with an emphasis on the functional properties of each commodity. Three chapters on food chemistry cover the chemical and physical properties of foods through the use of many easy to understand figures, tables, and illustrated concepts. Next the text includes an overview of food law that provides historical perspective as well as the latest information on nutrition labeling and food regulation. Thorough coverage of processing methods in included in all major food commodities as well as a background in microbiology and fermentation, food handling and safety, food contamination, HACCP principles and toxicology. The final chapters cover food engineering concepts and applications, biotechnology and the field of sensory evaluation and food product development with coverage of marketing principles.